This is one of the greatest times of the year with the leaves changing and apple & pumpkin picking in full swing. 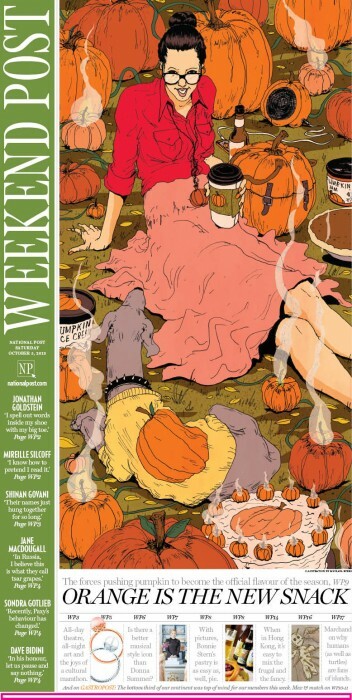 That’s why it was great fun for MICHAEL BYERS to illustrate this perfect cover for The National Post Weekend Edition called “Orange Is The New Snack: Pumpkin flavour has found its way into everything from beer to M&M’s. What’s Next?” I don’t know about you but if it’s pumpkin, I’ll eat it! Hope Mike got to go pumpkin picking with his lady for reference on this one – so fun!